← Join us for a night of alumni networking! 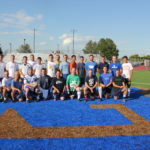 This year the men’s alumni soccer game is scheduled for Saturday, July 30, 2016. The teams will be picked between 5:15- 5:30 pm. (odd years VS even years). The game will start at 6:00 p.m. at Comet Field.